The other day I posted an entry about using MapInfo with Python and Qt (see http://woostuff.wordpress.com/2011/03/05/mapinfo-map-control-into-qt-python-form/), one big thing that I missed was support for callbacks, which if you want to do anything related to integrated mapping is a must for map tool support. Turns out it is pretty easy, and today I worked out how. This will be our callback object that we will need to create for MapInfo. _public_methods_ is a Python array of all the methods that you would like to expose to COM eg MapInfo in this case. This attribute is a must for creating a COM object. _reg_progid_ is the name of your COM application or object. This can be anything you would like. _reg_clsid_ is the GUID, or unique id, for the object or app. Do not use the one I have, call the following in a Python shell to create your own. SetStatusText is the MapInfo callback method that is called when the status bar changes in MapInfo. In order to use the class as a COM object we have two more steps to complete, one is registering the COM object and the other is creating it. This will register the COM object which will mean it can then be creating for use by MapInfo.
""" Callback class for MapInfo """
and the result is a map window and information printed to the console. 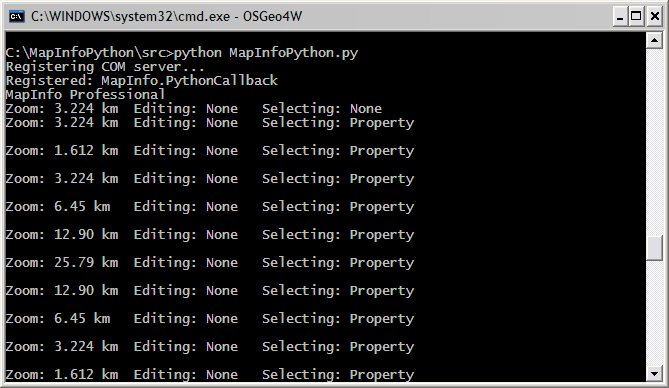 I think Python could be a good language to prototype MapInfo based app, or even build a whole app itself. If you do end up making something of it let me know I am quite interested with what people could come up with.